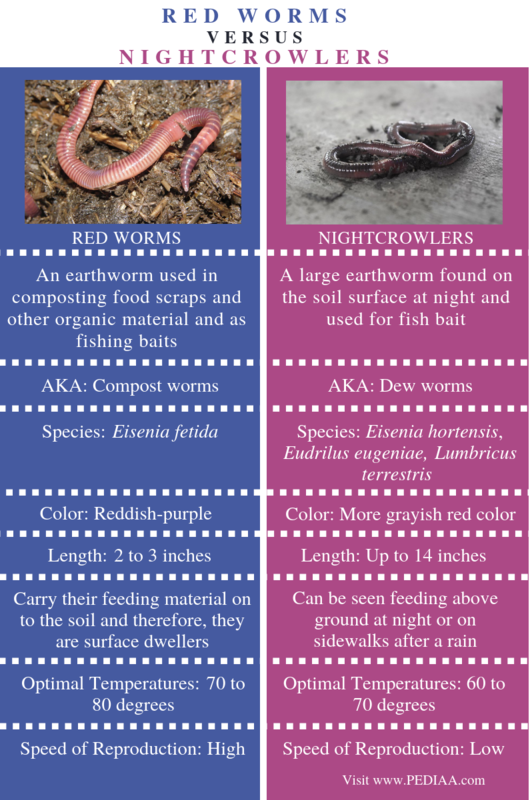 The main difference between red worms and nightcrawlers is that the red worms (or compost worms) are used in vermicomposting whereas the nightcrawlers (or dew worms) are worms that usually we can see feeding above the ground at night or on sidewalks after a rain. Red worms and nightcrawlers are different species of earthworms that can be important in the production of compost. Furthermore, red worms are reddish-purple in color and can grow up to 2 to 3 inches in length while nightcrawlers are more grayish in color and can grow larger up to 14 inches in length. Red worms or Eisenia fetida represent a species of earthworms mainly used in vermicomposting. 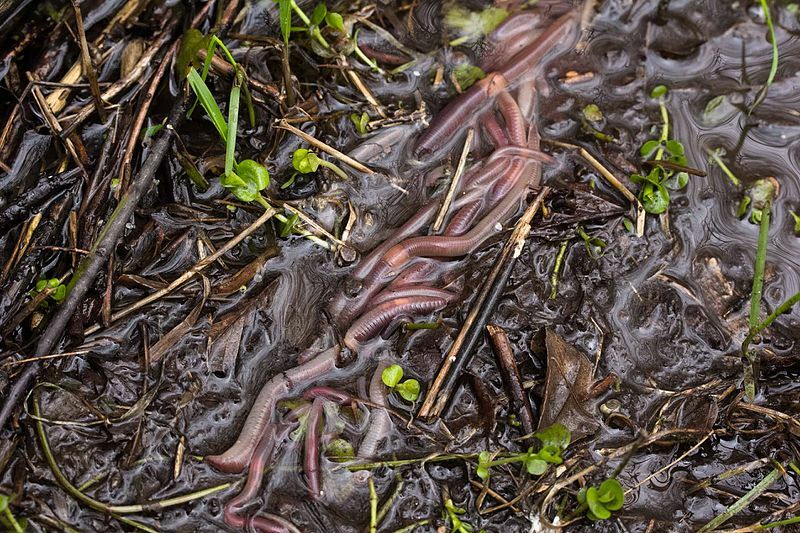 Some of the other names for the red worms are compost worms, red wiggler worms, brandling worm, panfish worm, trout worm, tiger worm, and red Californian earthworm. One of the main features of these worms is their adaption to live in decaying organic material including rotting vegetation, compost, and manure. Furthermore, two significant features of red worms make them more suitable for use in compost making. They are their surface-dwelling nature and high rates of reproduction. Usually, red worms continuously bring their food on to the surface. This reduces the requirement of turning the organic material continuously. In addition, red worms show higher rates of reproduction, which is usually seven times higher than the rate of reproduction of night crawlers. Nightcrawlers are a group of earthworms that feed above the ground at night. Also, they appear on driveways and sidewalks after a rain. However, they burrow during the day. Generally, the main species of night crawlers include Lumbricus terrestris (Canadian nightcrawlers), Eisenia hortensis (European nightcrawlers), and Eudrilus eugeniae (African nightcrawlers). They are also known as dew worms due to their night-feeding nature. Furthermore, nightcrawlers are an important type of worms for compost production as they bring nutrients from the deep soil on to the surface. Also, they can burrow up to 6.5 feet deeply to the soil. Therefore, they play an important role in soil aeration and draining. Red worms and nightcrawlers are two types of earthworms belonging to the class Oligochaeta. They are tube-shaped, segmented worms with a closed circulatory system and a coelom which serves as a hydrostatic skeleton. They are hermaphrodites and reproduce by joining through clitella. Moreover, they live in the top few inches of the soil, feeding on dead organic matter. Both of them are important in aerating and draining the soil. A red worm is an earthworm used in composting food scraps and other organic material and as fishing baits while a nightcrawler is a large earthworm found on the soil surface at night and used for fish bait. Thus, this explains the main difference between red worms and nightcrawlers. Red worms are also known as compost worms while nightcrawlers are also known as dew worms. The species of red worms is Eisenia fetida while the species of night crawlers are Eisenia hortensis (European nightcrawlers), Eudrilus eugeniae (African nightcrawlers) or Lumbricus terrestris (Canadian nightcrawlers). Another difference between red worms and nightcrawlers is that the color of a red worm can be reddish-purple while nightcrawlers have a more grayish red color. Typically, a red worm is 2 to 3 inches long while a nightcrawler can grow up to 14 inches. Hence, this is also a difference between red worms and nightcrawlers. Moreover, red worms carry their feeding material on to the soil and therefore, they are surface dwellers while nightcrawlers usually can be seen feeding above ground at night or on sidewalks after a rain. Temperatures between 70 to 80 degrees are ideal for red worms while the temperatures between 60 to 70 degrees are ideal for night crawlers. Speed of reproduction is another difference between red worms and nightcrawlers. The speed of reproduction is high in red worms while the speed of reproduction is low in night crawlers. Red worms or compost worms are a species of earthworms that are reddish-purple in color and 2 to 3 inches long. They are surface-dwellers, ideal for making compost. They also prefer warmer temperatures. On the other hand, nightcrawlers include several species of earthworms that are much larger and less reddish when compared to red worms. Their main feature is their feeding habits on the ground at night. 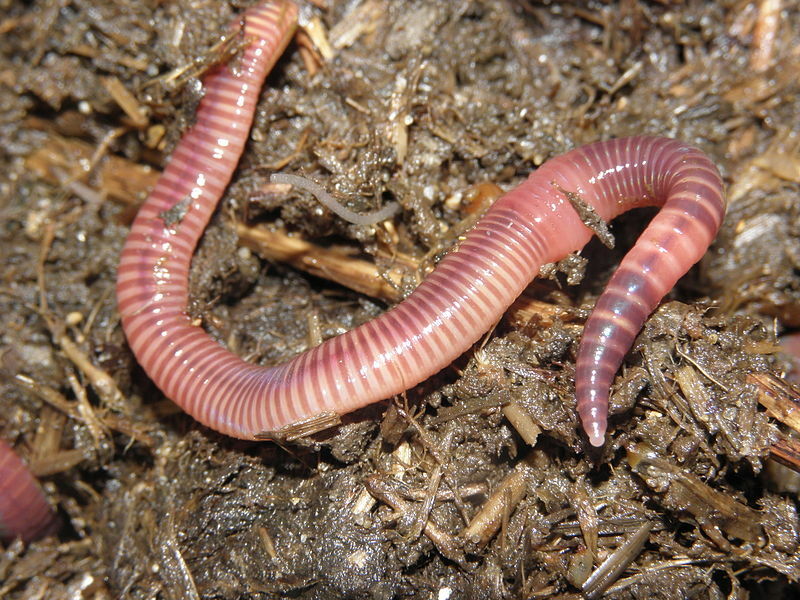 Therefore, the main difference between red worms and nightcrawlers is their appearance and importance in compost production. 1. Hubbard, E. “Ask the Worm Guys: The Three Types of Composting Worms.” Nature’s Little Recyclers, 30 Aug. 2017, Available Here.